You made me smile, laugh, cry, skip, worry, stop and think and then run like hell but we did it together 2012! Here’s to the end of a year and the start of a new. May this year be filled with love so strong it takes your breath away, joy and laughter that makes your finger tips and toes tingle, faith that keeps your soul lifted and hope that makes you fly. Hoping 2013 brings GOOD health to all my family and friends and may your home always be filled with family and friends that carry you to each New Year good or bad. Thank you to all of you who have helped, inspired, accepted and loved my family and I. Be safe out there!!! 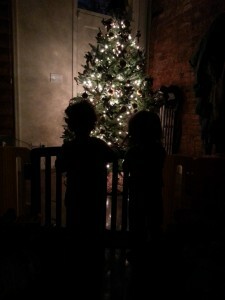 There is something so peaceful and serene about Christmas tree lights that immediately brings calmness all around you. You can feel the warmth from the tree surround you and all you can do is sit and stare at the beautiful lights shining back at you. It’s moments like these when you feel thankful for all the things in your life, big or small and appreciate the journey that brought you where you are today. I still can’t believe that God blessed me with two beautiful babies. Two remarkable, kind-hearted soon to be two year olds. God’s faith in me showers me with love everyday and keeps me strong to continue to be the best mother I can be. Thank you for loving me unconditionally. I do love my family, my life and my friends. It’s been an amazing journey and I can’t wait to continue along with all of you. Thank you for being a part of my everyday! This image will remain in my heart forever. Tonight the music was turned up as Giovanni, Isannah, Asher and I danced throughout the playroom floor. Smiles, laughter and mixed dance moves filled our home. I caught myself smiling so widely as I looked over at Giovanni trying to copy my every dance move while giggling, Asher flaring his arms in the air and Isannah shaking her coolie as she tries to snap her fingers. The happiness on these faces will last a lifetime. I can still hear Giovanni demanding more, more, more each time Asher and I tried to sit down to take a break. It wasn’t happening until they were completely done which was two entire songs later. Ah, but it was so worth it. I love my family…they are all of me.